"Features" section says 3.3V Â± 0.5V but datasheet says "2.7~5V". Which is right? I have used this antenna and GPS-00177 on otherwise identical GPS projects, and this antenna has a definite advantage over the other one. Both work well, but this one consistently picks up two to three more satellites at a time. The long cord and magnetic base are a nice bonus. is there a way to waterproof this antenna? I am interested to buy a GPS-09133, but i have a doubt. Is this antenna (Antenna GPS 3V Magnetic Mount SMA) to that gps module? Is this antenna right hand circular polarized? Circular polarized patch antennas can be accurate GPS antennas if used with a ground plane..
Any flat metal object will do, Ideally it should block (the antenna's view of) the nearby ground and be as level as possible... 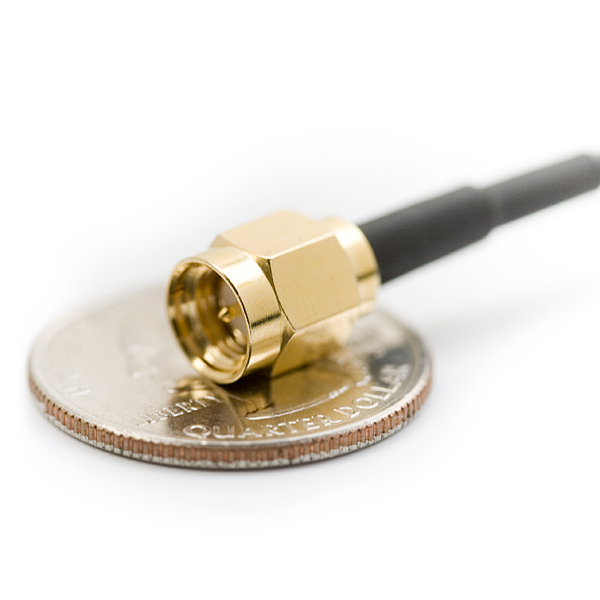 The antenna should be flat stuck right in the middle of the ground plane, like a turtle sitting in the middle of a plate. 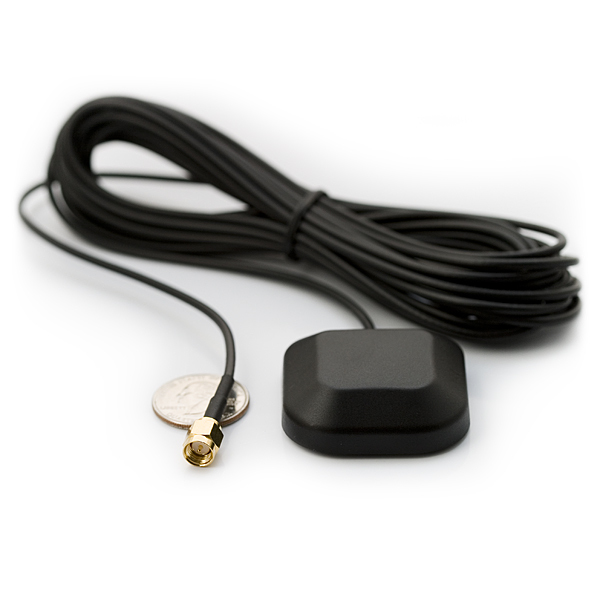 These antennas are quite critical in terms of design - more so than many other kinds of GPS antennas.. It should be tuned at the factory for whatever situation it will be used in. Removing the magnet might impact performance more than you would think. If this antenna is designed for use stuck to a car, even though it still has a ground plane its immediate surroundings are part of the tuning process..its performance in free air might change without a metal ground plane at that same distance. Also make sure its pointing up. @Joshua: The benefit of using the magnet to attach it to the top of the car is the giant ground plane that the sheet metal acts as. "the magnet will hold the antenna in place at speeds greater than 100mph"
I'm willing to bet this will handle speeds > 100mph. I've had it around 60mph while pulling a little less than 1.1g lateral and it's never remotely budged. I might be willing to test this out. It takes a LOT of wind force to move a strong magnet like this. I'm sure it would hold as well, but it will just have to be tested. I'll be slapping this puppy on the outside of a Cessna. I'll let you know if it comes off at 120 knots! Hillarity. Thank you for that, sir. Is it possible to remove the magnet to make this lighter? I used this antenna with the GPS-10920 logger and it picked up signal from my office window very fast and without a hiccup! It also has a long cable (5m) that helped out a lot to place the antenna away from the lab-bench. I used this with a Venus GPS and put it on a Porsche that clocked about 105mph on a very bumpy road course (Harris Hill) - gps got a quick fix, and it stayed on the car - no complaints here. Hopefully it stays on at TWS..